Bond splashing The World is Not Enough traffic wardens here. Description: This is the location where in The World Is Not Enough, James Bond checks his onboard map and cuts across the Isle of Dogs. 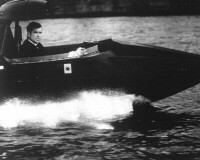 He pilots the indestructible Q Boat down into the canal, splashing the traffic wardens before plunging through the 'specially constructed' London Canoe Club clubhouse to intercept the cigar girl near the Millennium Dome.